Evolve or perish. It’s a maxim in the movies as it is in nature. Willis O’Brien took these words to heart, and we’re fortunate he did. Like all great artists (and inventors), the animator was not easily satisfied—he was always pushing for something more complex, more adaptable, more compelling. 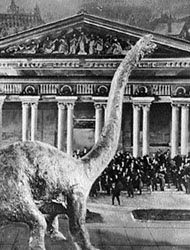 By 1925, O’Brien had completed several short subjects using stop-motion technology, including The Dinosaur and the Missing Link: A Prehistoric Tragedy (1915) and The Ghost of Slumber Mountain (1918). Much later, he would bring dinosaurs and a great ape to life in his magnum opus, King Kong. 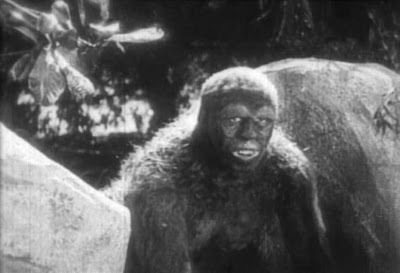 That film’s stop-motion effects and live action were combined with more realism and drama than any the audience had seen before, and it was thanks, in part, to the techniques O’Brien developed for The Lost World—a film that, in its successes and its failures, pointed the way to a proper marriage between spectacle and story. The Lost World is based on Arthur Conan Doyle’s 1912 novel of the same name, concerning an expedition by a group of men with differing goals. Their shared destination is a plateau of rock, hidden deep in the Amazon jungle, upon which live creatures forgotten by time. Professor Challenger (Wallace Beery) has been there before; however, without physical evidence to back up his claims, he has become an object of ridicule back home in London. Challenger has returned to the plateau to shut up his critics. He’s joined by Professor Summerlee (Arthur Hoyt), a sceptic; Lord John Roxton (Lewis Stone), a big-game hunter and adventurer; and Ed Malone (Lloyd Hughes), a timid newspaperman hoping to prove his courage to a shallow fiancé. Several servants follow. The film adds a pretty girl, too. This is Paula White (Bessie Love); daughter of the explorer Maple White, who, in the movie’s version of events, followed Challenger into the rainforest the first time and never came back. Mr. White comes in handy in a couple of ways: first, his disappearance provides Challenger with the means to return to the jungle, as Malone’s paper agrees to fund the trip as a ‘human interest’ story. Second, White’s notebook of sketches (which made it home, even though he did not) provides us with several drawings of the dinosaurs we’ll soon see, along with a diagram of the rocky plateau. This builds suspense, but more importantly, it helps us orient ourselves once the action starts. We know the animals are “tremendous in size and ferocity,” as Paula puts it, and the notebook’s doodles enforce the point, offering us scale drawings of cowboy-hatted humans and dinosaurs together. Many films have used this technique since, including Titanic. Does the effect work? We watch the Pteranodon fidget, and eat, then we watch the faces of the explorers. They’re suitably amazed. But somehow, we aren’t. 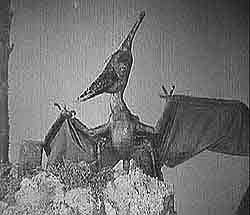 Like other animals in The Lost World (and in King Kong), the Pteranodon moves stiffly. There is little sense of its underlying musculature, since the rest of the body stays unnaturally still while one part is in motion. Anatomically, though, O’Brien’s rubber model conforms to what we’ve seen in our picture books. If it didn’t move at all, we’d be inclined to believe in it. The bigger problem is that this scene lacks energy, as do the dozen or so special effects sequences in The Lost World that follow. O’Brien had figured out how to animate fairly life-like creatures—animals that looked accurate, moved at the correct speeds, and even presented the minutiae of life (watch the Brontosaurus breathing in later scenes), but neither he nor director Harry O. Hoyt knew how to make the monsters and humans interact. The Lost World’s technical limitations inevitably place the humans at the bottom right of the screen, like scurrying ants before some epic battle between giants; they no more look like a part of the action than if they’d walked onstage in front of an IMAX screen. O’Brien’s effects, intriguing on their own, end up slowing the film, because we never feel the humans are in danger. They say they’re in danger, but in the movies, seeing is believing, and none of Hoyt’s tricks quite gets around that. One of his tricks is to cut from the dinosaur battle scenes (which appear to be long shots, though they aren’t) to close-ups of an actor’s face, usually Bessie Love’s. Her expressions of fear are meant to convey immediacy, but with no connecting shot between her and the dinosaurs (which are photographed in one, static take), the result is flat. Another trick is to introduce an ape man (Bull Montana) as a live-action antagonist. The ape man pays more direct attention to the humans than the dinosaurs ever do (that’s part of the problem), but he tends to do his damage from afar. This is necessary, because while the ape man may be more intelligent than the dinosaurs, the humans are armed. He, too, is more of an implicit threat than an actual one. The result is a film that stands up better as a case-study in special-effects-development than it does as drama. Like 20,000 Leagues Under the Sea (1916), it puts spectacle first, and therefore suffers today, because the audience’s expectations, like the technology itself, have grown more sophisticated. The Lost World is the better film, though; its acting is solid, especially Beery’s comic portrayal of Challenger. And in the film’s last sequence, in fact, O’Brien gets everything right. In The Lost World’s best, and most famous, scene, we witness a captured Brontosaurus rampage through the streets of London. At first, this scene falters like the others before it—we are told, rather than shown, how the huge animal’s cage broke loose over the dock and set it free. But things pick up as the Brontosaurus plows through the urban landscape. While O’Brien is still unable to fully integrate footage of the crowds with footage of the beast, he makes use of life-scale modelling to bring the two elements together. Actors in the crowd are bowled over by a giant tail, for example, allowing the dinosaur to be ‘present’ among the extras. Then we see a mother and infant trapped in the dinosaur’s path. Hoyt cuts from the stop-motion animal to the cowering humans and then—crucially—inserts a shot of a giant, clawed foot bearing down upon them. 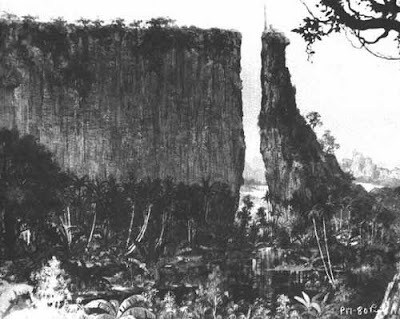 This kind of shot, used liberally in King Kong, but nowhere else in The Lost World, is precisely the visual bridge the earlier film needed all along. O’Brien was continuing to grow. The Lost World is available on DVD through Image Entertainment. The extras are a little thin (a documentary would have been great, given the subject). The disc includes animation outtakes and a variety of production stills. Of note is the score, which combines native drums (an inspired choice) with what sounds like a theremin.